From the 1920s to the coming of the Occupation, a new breed of artist prowled the fabled streets of Paris. Combative, disrespectful, irresponsible, the surrealists broke aesthetic conventions, moral boundaries - and sometimes, arms. They sought nothing less than to change humanity by means of a worldwide psychic revolution. Their names resound through pop culture and the annals of art history. In this comprehensive campaign guide for Trail of Cthulhu, you recreate their mundane and mystical adventures as you stumble onto the Dreamlands, a fantastical realm found far beyond the wall of sleep. At first by happenstance and later by implacable design, you remake it in the fiery image of your own art. Will you save the world, or destroy it? Put up your dukes as two-fisted filmmaker LUIS BUNUEL. Flee a formless entity as Dada impresario TRISTAN TZARA. Photograph tentacled entities as American expat MAN RAY. Personify the joy and decadence of the city as chanteuse KIKI DE MONTPARNASSE. Wield the magic cane that will end the world as theatre of cruelty inventor ANTONIN ARTAUD. Or arrive in Paris as fresh-faced young painter SALVADOR DALI, who has come to tear the movement all down and rebuild it in his image. A guide to Paris in the 20s and 30s, from the swirl and sin of Montmatre to the staged atrocities of the Theatre du Grand-Guignol. A tour of its occult depths, from primeval Druids, to today's opium-addled ritualists. 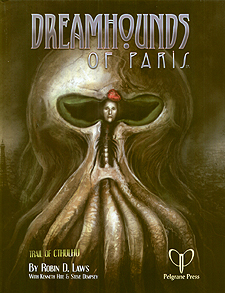 A survival manual for invaders of dream. Do you shape the Dreamlands to your will, or surrender to its madness? A gazetteer of 43 dream locales, from the meandering River Ai to the furnaces of Zar, where yesterday's useless poets burn. 13 monsters of dream, from the familiar yet terrifying gugs and ghasts to the new grotesqueries like the bulbhead and putrefacto. Brilliant advice to help you pull off the campaign of your GMing career. And a full introductory adventure, in which the characters meet that notorious icon of Gallic literary madness, Maldoror. The Dreamlands are as strange as you can imagine.